Home > BalaTampoe > feature > History > LionelBopage > srilanka > Comrade Bala Tampoe, the Legacy Is No More! Comrade Bala Tampoe, the Legacy Is No More! ( September 4, 2014, Sydney, Sri Lanka Guardian) Meeting with comrade Bala Tampoe at the Ceylon Mercantile Union (CMU) office in Colombo had been a tradition I looked forward to whenever I visited Sri Lanka. At the end of July, after attending my mother’s funeral in Sri Lanka, I paid a courtesy call to comrade Bala at his house in Ratmalana. When he opened the gate for me, I saw in his soul and eyes a fit and active comrade with a frail body. We had the occasion to have a long chat over many topics usually talked about when leftists get together: trade union movement; neo-liberalism and socialism; the left; the JVP; women’s rights; corruption; family rule; and human rights. As usual, his talk was never ending, though when he narrated his non-recollectable accident while walking from home towards Galle Road, he appeared to understand the fragility and morbidity with which all human lives end. That was something new in our conversation. He was living alone in his run-down house, full of books both old and new covered with dust. With his wife, late comrade May Wickramasuriya’s photo still decorating one of its walls. He was personally concerned about the individualistic, selfish outlook of the younger generation in the world recounting his personal experiences. He was also in the process of compiling his life experiences into a biography. I am glad that I had the occasion to catch up to show my appreciation, gratitude and respect for a comrade, who had been fighting for fairness and justice in his own way. For better or worse, he was the legendary General Secretary of the Ceylon Mercantile Union (later changed to Ceylon Mercantile, Industrial and General Workers Union) for almost 66 years, continuing with the struggle he commenced in 1940s as a trade unionist, then as a leader of revolutionary Sama-Samajism (equal society) uncompromisingly fighting against the class betrayals of the traditional left and also as a human rights defender. He gave generously of his time pro bono to help activists like those in the JVP , who were being prosecuted by the state. His major activities remained among the urban workers, in defending their right for decent working conditions. I always remembered comrade Bala’s words uttered in 1983, after the defeats in the presidential election and the referendum: "I see history as waves. So far we have been in a receding wave. But even in the gloomy oppressive atmosphere of Jayewardene's rule, I can see an advancing wave that will soon shatter all tyrannical forces ahead of it." I believe these prescient words still stands very true in the current social, economic and political context. Comrade Bala also used to narrate his life story to us. He thought that it was his personal nature and commitment to fairness and justice that brought him along the path of the working class struggle. It was comrade Bala’s exclusion based on his nationality to a famous English school in India that had probably impacted his life making him to strongly support the anti-colonial struggle of the day. Undoubtedly, not only all left wing and progressive sections of the society, but also all those who like to see peoples’ democracy in action, will positively appraise the tremendous and significant role played by comrade Bala in the Sri Lankan political arena. Here I will restrict myself to recounting my encounters with comrade Bala, formerly as a JVPer. When the JVP was in its formation stages, in its original clandestine form, known as the ‘movement’, the Revolutionary Marxist Party (the RMP) led by comrade Bala was one of the first groups that expressed critical solidarity towards it. 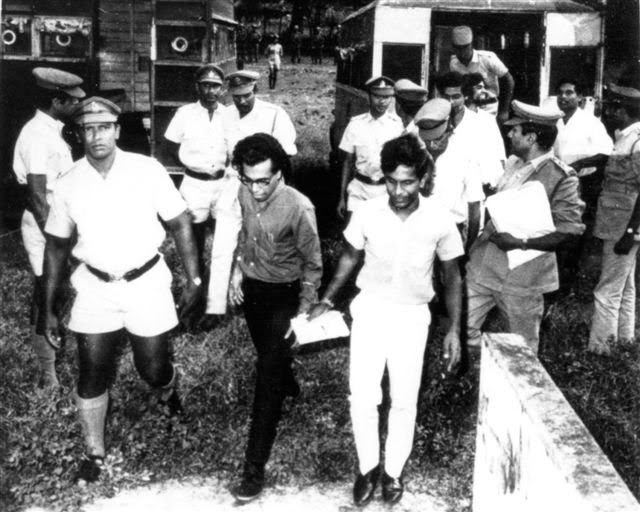 The JVP's first encounter with more radical Sama-Samajists was when the comrades of the Lanka Sama Samaja Party (LSSP) Ananada Premasinghe and Marshal Perera appeared on behalf of comrade Rohana Wijeweera when he was incarcerated by the state in 1970. Though we had Stalinist and Maoist political affiliations and they had Trotskyite political affiliations, those differences did not matter when it came to opposing state repression. We had something in common, the real danger to our democratic rights of freedom to political expression from the ruling elite. Comrade Bala, the RMP and the CMU continued to protest against the illegal and continued detention of cadres and leaders of the JVP. By appearing in courts on behalf of some of the JVP activists, they defended the democratic rights of the JVP to publicize their political views. The CMU protested against the arrest and detention of nearly four thousand JVP activists, many who had been tortured by the security forces. They also opposed the declaration of a state of emergency in March 1971 which empowered the security forces to dispose of dead bodies without holding post mortem examinations. In the 1970s while we were behind bars, comrade Bala with others formed a human and democratic rights organisation and campaigned for our release. In 1971 and 1972, comrade Bala’s brilliant knowledge and understanding of Marxism and Law brought another dimension to the whole CJC trial in that a holistic class perspective of the April 1971 insurrection could be presented to the world. While the state represented in the unholy alliance of the SLFP, the LSSP and the CP, was scurrilously trying to portray the JVP as a bunch of murderous terrorists, with the assistance of comrade Bala and his team we could rebut those allegations vigorously. It would be remiss of me not to mention the late comrade May Wickremasooriya who was personally committed to defending the JVP youth. She was firmly supporting her husband comrade Bala in his more than full time work in doing this. When the JVP leadership was released from prison in November 1977, we had only one shelter to go to and that was the CMU office in Colpetty. On that happy day we met many CMU comrades, held our first press conference at the CMU headquarters and embarked on a political campaign that gave rise to post-1977 JVP. During the long political discussions we had in the seventies, comrade Bala often talked about the need of the deadwood in the left giving way to new shoots that needed to be nourished. The political collaboration between the JVP and the CMU became visible when a United Red May Day rally was held in 1977. Whenever human and/or democratic rights of the people were under threat or violated, comrade Bala was at the forefront making the masses aware of the situation and demanding with passion an end to such violations. Comrade Bala and the CMU have been consistent champions of all working people and the oppressed irrespective of their racial, linguistic or religious background. Comrade Bala, The RMP and the CMU opposed the government policy of inequitable treatment of people on the grounds of race, language and religion and advocated regional autonomy for Tamil speaking people as a just solution to the national question. Comrade Bala and the CMU continued to condemn the killings by all sides to the conflict. They also pointed out how the anti-terror laws have contributed to the steady growth of rebellions, anti-government activities and national disunity. Comrade Bala maintained his left credentials despite many of his erstwhile colleagues joining the ranks or supporting the ruling elite. He was the driving force influencing the CMU to take just and fair stands with regard to many national political issues. As a revolutionary at heart he never wavered from his uncompromising class positions. The best way for us to respect comrade Bala’s revolutionary ideals would be to rebuild the CMU and to discuss the many questions openly, publicly, and with complete honesty. The CMU has to produce leaders who could succeed in their day to day struggles while adhering to the democratic and legitimate traditions it has upheld since its inception. The CMU fought for the autonomy of unions and organised workers to fight against any attempt to submit them to the whims of the bourgeoisie. They also fought for the workers’ control of the working-class movement. The CMU was and is independent and able to fearlessly express its views and take action on human and democratic rights violations. The strength of the CMU will continue to depend on its membership and the quality of their leadership. I have no doubt that those who were in the JVP in the seventies and early eighties and those who continue to-date to work for fairness and justice will join me in extending our revolutionary salute, deep respect and fraternal gratitude to comrade Bala. Whatever happened in terms of political and trade union history, comrade Bala showed by example, the significance of a working class that remains cohesive and united despite divisive norms and rules imposed from without. I express my revolutionary salute and fraternal political and personal gratitude for the positive role comrade Bala and the members of the CMU under his able leadership jointly played in the post war history of the Sri Lanka, and for the genuine and determined class assistance extended to the JVP in the seventies, when we most needed it while being behind bars. Your fraternal services to the working people in Sri Lanka will never be forgotten. Your dedication, loyalty and devotion to the cause of the working people will remain forever in our hearts and continue to provide us with inspiration to endure along the path you have set through your exemplary life. I have been ever grateful for his legal expertise and advocacy on our behalf (free of charge) during the trial of leaders of the 1971 JVP insurrection at the Criminal Justice Commission (CJC).